I'm a person who always wants a super long hair, like real super long until my leg! The longest I've went is only till my waist, but I can't bare it anymore cause the longer hair I have, the lesser hair I got on my roots! And honestly, I regret for going short. But now, I don't need to wait further more for my hair to grow longer till my desire length because I have my Irresistible Me Hair Extension! Now I can instantly go from short hair to long hair whenever I want! Irresistible Me is a growing brand of 100% natural Remy clip-in hair extensions, hair accessories and hair tools. Irresistible Me specializes in high quality extensions at great prices. They actually contacted me at the perfect moment because I just changed my hair colour few days ago at that moment, and YES! They have the exact hair colour as I did which is Rosewood, a purple tone red colour! It's a US based company and they ship worldwide! And guess what, I received my parcel within 2 days of making order! The origin of the product was from China and I'm super impressed with FedEx's efficiency! I've already fall in love with their shipping service! Now let's get started by unboxing the hair extention first. 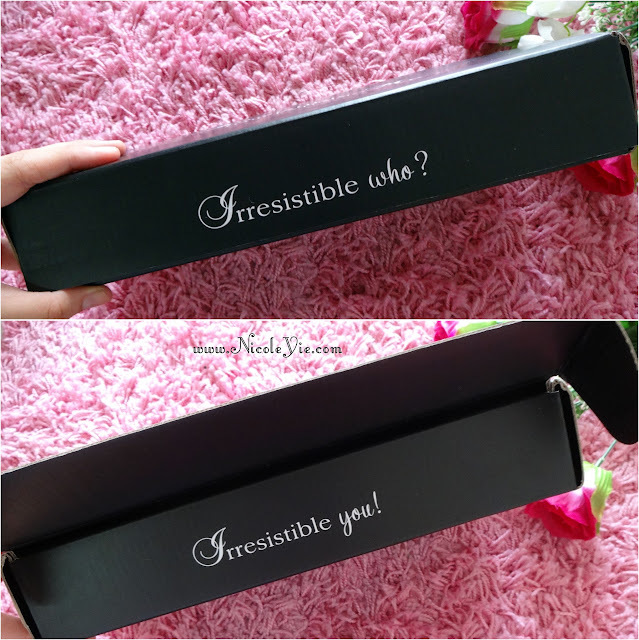 The box comes with seriously cute words that I have to collage and show you! The box looks so unique and different than any other boxes I received before! In the box, it comes in 2 sets of hair. The smaller set (1 piece, on the right side) is for you to check the shade and length before you open the full set in case it's not the one you ordered. If it's not the right one, send it back cause they will need to keep it. You won't be able to make changes if you realized the big version is not the one you want. The small version with a few extra hair clips. And it looks something like this. If it's the right shade and length, you can proceed to open the full set of the extension. The full set of clip-in hair extension. Everything was well wrapped with the net. I'm super impressed that it looks and feels just like real hair! Can't believe that it's so smooth! Each extensions comes with these easy-to-open-and-close clips that help the weft to secure tightly and comfortably to our own hair without any risk of falling out. The 100g package comes with 9 pcs of the extension. The longest length is 24 inches, and mine is 22 inches because I desperately want a super long anime hair! Short hair to 22 inches of long hair! I'm loving the length like mad! The colour blends in so well to my exact purple tone red hair colour as seen under the sunlight! Even the curve of the extension matches my hair's natural curve. This is just my first time wearing a full head hair extension. It really takes times and practices to get the perfect and natural look. For the first few times, I find it quite difficult to do it by myself, especially I have thin and less hair, the shapes of the weft will somehow appear on my head with some uneven shape. As mentioned, the extension is made by real hair, and it's smooth at the beginning. But after a few times wearing and without completely brushed through, the hair will tangled, just like our own hair. Just remember to take good care of it while keeping it and brushing it, just like how you take good care of your own hair. 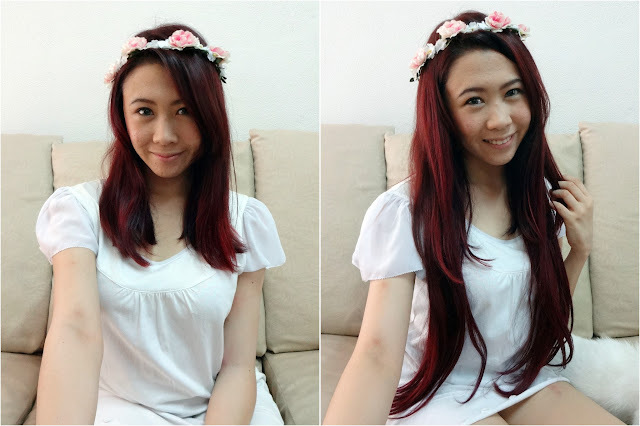 Too bad that Rosewood is not my original hair colour and now the purple tone on my hair is getting lesser. So my advice is if you really want to wear it like everyday and forever, don't dye your hair and get your original hair colour! Overall, I'm impressed with the quality and how natural it turns out on me! Here's the video of the detailed explanation on how to use the clip-in hair extension by Irresistible Me.